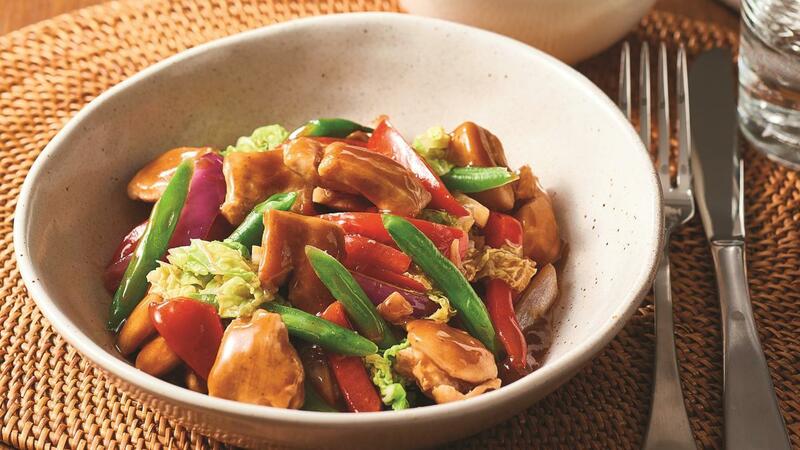 This stir-fry dish uses gravy as a base for the sauce. Simply adding KNORR Chinese Honey Soy Sauce GF and Garlic Puree to the already prepared gravy makes a milder sauce, that is also more cost-effective. Heat water in a large saucepan and whisk in CONTINENTAL Rich Brown Gravy, bring to simmer and reduce heat. Add KNORR Chinese Honey Soy Sauce GF and KNORR Garlic Puree. Slice the chicken into fine strips. Slice the beans, onions, cabbage and capsicum. Heat oil in a large fry pan or wok and cook the chicken. Add beans, onions and red capsicum and cook for 10 minutes. Add the cabbage and cook for a further 5 minutes. Add the Honey Garlic Stir Fry sauce. Serve with steamed rice and chopped shallots. Tip – CONTINENTAL Professional Rich Brown Gravy can easily be used as a base for many other sauces. Just add other flavours and ingredients to create your own range of signature sauces.